Frankfurt am Main is a founding member of the "Climate Alliance of European Cities" and aims for a 100% renewable energy supply by latest 2050 for the whole metropolis. 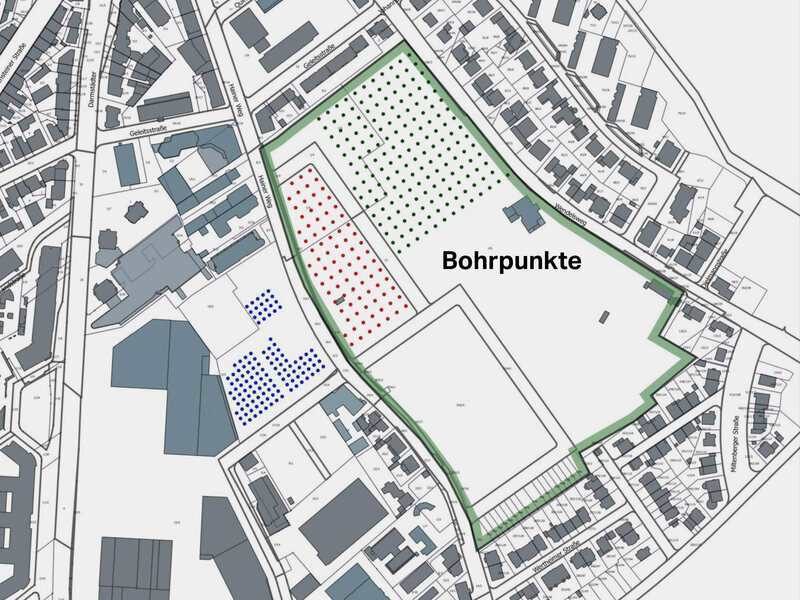 In order to fulfill this goal, the city has committed to new housing targets: New dwellings are to be built to Passive House Standards or to exceed German building code (EnEV) requirements by 30%. The former site of the Henninger brewery is to be rebuilt with detached multi-family houses and park-like landscaping. The sustainable “city villas" will provide a high-quality living environment. The construction area at the former “Henninger Turm” is divided into three sections with a total floor space of 81,039 m² (872,296 ft²). Transsolar was contracted to create the energy supply concept. This central heating plant is energy-efficient and cost-effective to maintain; with all major components in one location, servicing is easier and monitoring is straight-forward. The system has several elements which all work in synergy: Geothermal boreholes and a central heat pump provide the majority of the heating energy. In summer the geothermal system provides cooling to the floor (heating) system. This re-generates the geothermal field for the next winter season. Solar thermal collectors also provide heating and domestic hot water heating energy, which enables the geothermal system to have a longer lifespan. The third heat source is a cogeneration unit, which also provides electricity to the development. Finally, peak loads are covered by a gas boiler. The city villas on construction site 1 were completed at the end of 2016 and have all been purchased. The construction site 1 is in use since two winter periods. A monitoring shows good energy results for heating (approx. 28 kWh/m²a) and a good accordance with the dynamic simulations of the buildings. The heating demand for hot water is approx. 50% higher than calculated and achieved around 21 kWh/m²a. This may be caused by showers installed having a higher flow rate (36 l/min) than typical showers (12 l/min).